LP version. 40 years later the mythic album is available! Lies of omission and appropriations. The story of a magnetic tape that contained a trade secret. Four decades after My Sixteen Little Planets's release (on OHR, 1975), Inventions For Electric Guitar, the solo debut by Ash Ra Temple guitarist Manuel Göttsching, is now a classic, an undisputed worldwide reference. Inventions was made using only an electric guitar and a simple four-track tape recorder. Inventions was the challenge, and so was its impact. Göttsching recorded it in July-August 1974 in Berlin, after a sudden technical revelation. The original LP sleeve had the following printed on its back: Manuel Göttsching (guitars only). Manuel played his guitar and used a 4 track TEAC A3340, Revox A77 for echoes, wah-wah pedal, volume pedal, Sola Sound Fuzz, Schaller Rotosound, and Hawaiian steel bar. The reaction was unanimous: this was a significant innovation, in terms of both technique and creativity. However, there are little-known facts to this case. In early 1974, Göttsching's label received a tape sent by M.A.L. -- same design, same configuration, almost the same tracks. This is known by only a handful of experimental musicians from the Charleroi area. M.A.L., aka Daniel Malempré, is the actual inventor of this technique which Göttsching reproduced a few months later. Given the above, it's suggested that you listen to both albums. As doubts are removed, the truth sets in, forty years later. Here's hoping that this will ease the deep disgust that made M.A.L. leave his guitar untouched for so long. 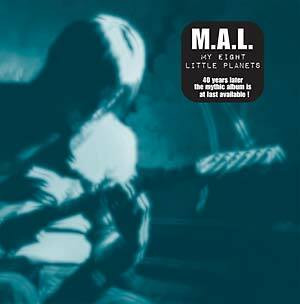 All music by M.A.L. on Fender Stratocaster 1964 with a wah-wah Cry Baby. Recorded and mixed at home between 1972-1976 on a reel-to-reel recorder, Sony TC-630.